In the last decade, a number of previous research studies in the Applied Linguistics, TESOL and TEFL focused on the issues of language alternation and their iii role in the interaction between teachers and students. But no such research was conducted to address these issues in the context of Pakistan to understand the reasons for teachers' code-switching between English and Urdu in the TEFL classroom. Pakistan is a multilingual country, and educational institutions are essentially bilingual and cannot be made free from the influence of bilinguality. Moreover, English courses are designed for teaching English as FL and SL (in some cases only) and the execution of these courses in the classrooms includes code-switching. Since both trainers and trainees are bilingual, they code- switch to perform different functions in the EFL classrooms. 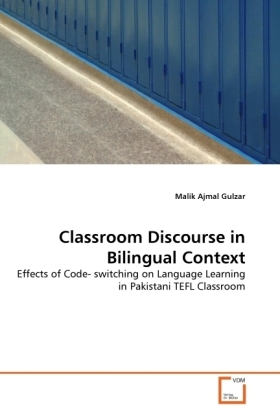 The present research tried to explore these functions of code-switching in the bilingual classroom discourse with special reference to the Diploma TEFL classroom at Allama Iqbal Open University Islamabad, Pakistan (hereinafter AIOU).